When it comes to gardening, I have many more fails than wins. Am I learning anything? It reminds me of taking yoga at a new studio and checking the beginner box, even though it certainly isn’t my first class. I’ve had seasons with more beets than I could stomach; this year only a handful have sprouted and something is killing the radishes that grew with so much promise only days ago. I would give up altogether if I didn’t love it so much. Seedlings are so precious. The first two leaves look much like any plant, but when the next two appear, lacy carrot leaves or ruffled kale, you know what’s coming. Some watch the evening news while I water my garden. I note the day’s casualties and triumph in those that somehow managed to survive. 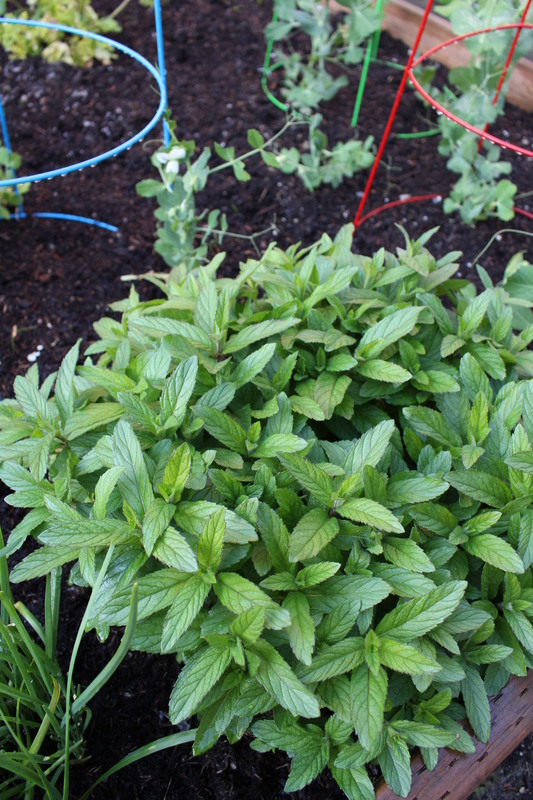 The mint in my garden is outgrowing the spring starts by far. 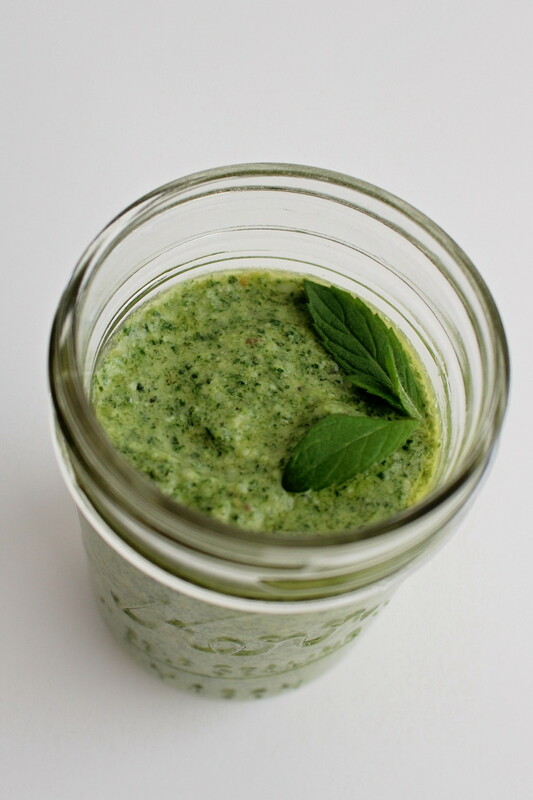 In an attempt to prevent it from taking over, I anticipate making a lot of this mint pesto. I enjoyed this recipe from the PCC newsletter last spring. Mint pesto is wonderful with pasta and peas. 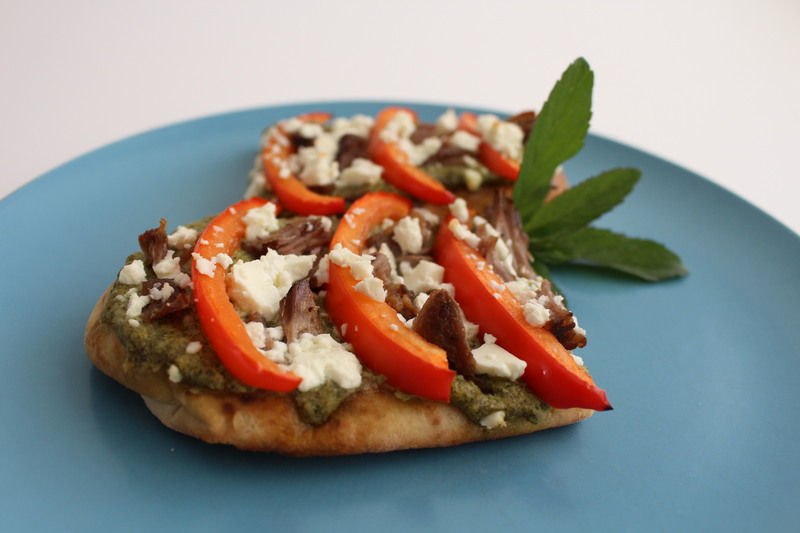 Tonight I used the pesto on this Mediterranean-style flatbread. I like to prepare things that may be used in a number of ways. Then it doesn’t feel like leftovers at all! 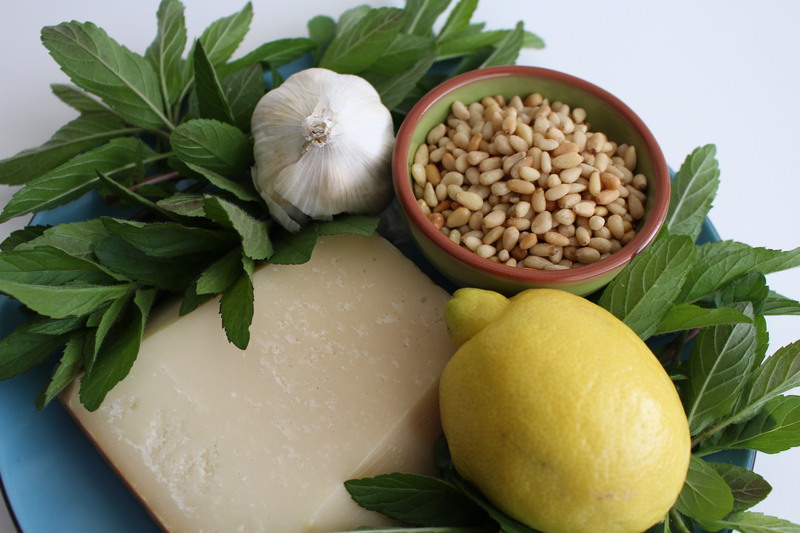 Place mint, garlic, lemon juice and zest, nuts, cheese and salt in a food processor. Pulse until well combined. Slowly add the olive oil while the machine is running, until smooth and glossy. Makes 4 servings. I used lamb loin chops that I cooked in my Crock-Pot; ground lamb or lamb sausage would also be good. Preheat oven to 400°. Spread pesto on flatbread and add toppings. Bake directly on wire oven rack for 10 minutes. Serves 1. I received a jar of this for my birthday and I’ve eaten two thirds of it before my husband has ventured to try it. It’s tangy, refreeshijng and good on anything! Eggs in the morning even.